We have already noted stories about emus, dogs, rabbits, wild pigs and even turtles running across runways along with onboard incidents involving a bat, scorpions, snakes (and not the movie Snakes on a Plane) and even crocodiles (one croc may have crashed an aircraft in the Congo) but the latest unusual incidents involved bees and a bull. In the bee incident, a Delta commuter flight bound for New York at the Pittsburgh International Airport was delayed by a honeybee swarm under the left wing of the aircraft. Apparently, these type of bee swarms are not uncommon for airport’s maintenance crews to deal with as it’s the fourth one discovered so far this year. 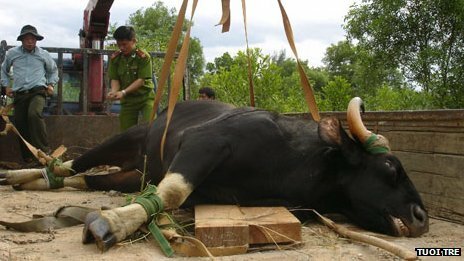 The BBC later reported that the bull had died (it may have also killed an 85 year old woman) and that an autopsy revealed that it had heart problems and stomach bleeding plus it had suffered from dehydration and exhaustion from roaming the woods that border the airport (and again, that’s no bulls***!). OK, guys, since when did they start mounting wings backward on airplanes, or are those bees not on the trailing edge of the ‘right’ wing?